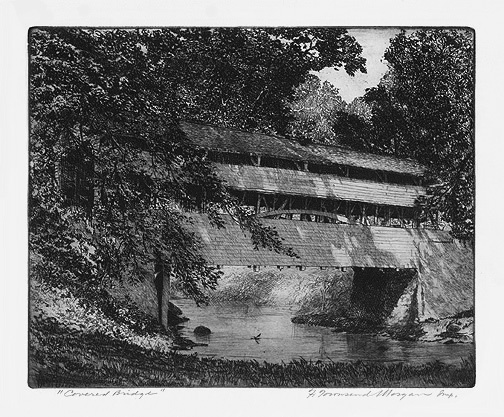 Covered Bridge - - c.1915, Etching. Image size 7 3/4 x 9 5/8 inches (197 x 244 mm); sheet size 11 x 12 3/4 inches (279 x 224 mm). A superb impression, in warm black ink, with skillfully controlled plate tone, on cream wove paper; full margins (1 1/2 to 1 5/8 inches). Pale tape stains on the sheet edges, verso, otherwise in excellent condition. 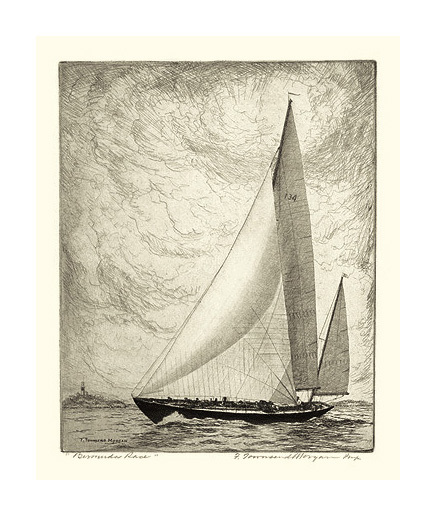 Bermuda Race - - 1955, Etching. Image size 9 11/16 x 7 13/16 inches (246 x 198 mm); sheet size 12 3/4 x 10 7/8 inches (324 x 276 mm). A fine impression, on off-white wove paper; with full margins (1 1/2 inches), in excellent condition. Published by Geare-Marston, Inc., Philadelphia and New York, as a gift with an attached description and greeting: "Bermuda Race is the subject of this original etching by F. Townsend Morgan, which shows the sleek 78-foot yawl Bolero on the starboard tack crossing the finish line off Bermuda with St. David's Head Light in the background. Bolero was first to finish in two of the last three Bermuda races, though not judged the winner because of time allowances. Since its inception in 1906 the Bermuda Race has become one of the world's great ocean classics, its continuity broken only by two world wars. In 1924, it was made a biennial instead of an annual event. With this etching go our sincere wishes for a very happy and prosperous 1955."